The Business Process Model and Notation (BPMN) is the leading standard for business process modeling. It is maintained by The Object Management Group (OMG) and supported by a wide range of vendors and employed by numerous organizations. Enjoy this BPMN introductory guide to the core elements and their purpose. Pools and Lanes — How do I define responsibilities and organizational boundaries within my process landscape? Pools and lanes define responsibilities within a business process. Hereby, a pool is a unit with clear organizational boundaries to its environment, such as a company or an organization. Lanes are always contained by a pool or another lane and communicate with other lanes within the same pool without any restrictions. 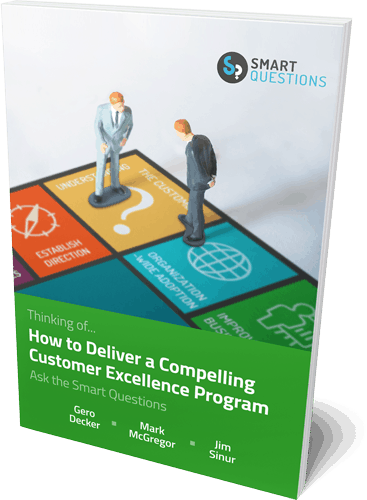 They typically represent the different roles that execute a process – the process participants. For example, a company (pool) may have three departments (lanes) that collaborate on a business process. Within a department, a set of tasks might always be executed by exactly the same person, which is represented by its own lane. However, it is more likely that tasks can be carried by all persons who have a specific role. Below, you see a pool that has an organization (research department), role (spacecraft engineer) and a specific person (Mr. Doe) as lanes. Understanding Pools and Lanes explains how to work with pools and lanes in detail. How do we achieve our goals? By taking action. Activities are the elements of BPMN that represent actions. Tasks — What are the steps of my business process? Tasks are actions which a process participant completes step by step to reach the process’ business goal. Therefore, a task is always assigned to one lane. If multiple persons or roles share a task, you can use the BPMN extension “additional participant”. If you compare the semantics of a task with natural language, the process participant will be the subject of the process – someone who is doing something. The activity will be the verb, and commonly there is an object in the activity’s labeling: when the process participant performs his action on something, for example a document. When labeling tasks, you should follow this predefined structure, most typically a verb + object syntax as in “build rocket”. For sequential execution, tasks are connected by an arrow or the sequence flows. In the example above, the Spacecraft Engineer first thinks and then builds (the) rocket. How do I abstract from details? When documenting a process, you often lose track after adding more and more details. 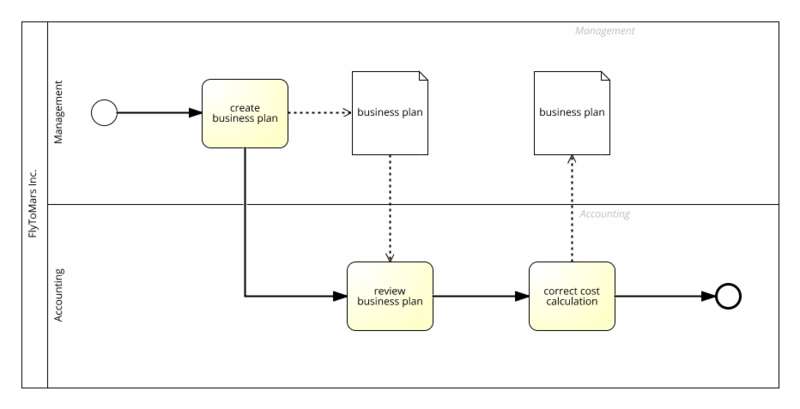 The business process may seem too complex to capture in one BPMN diagram. In this case, sub-processes will help you: They move the details of complex tasks to separate sub-processes. To learn more about process hierarchies and how to model them using BPMN, see Making Your Stakeholders Lives Easier with Subsets. Events are signals that something happens – this includes the start and end of a process as well as any interaction with the process’ environment. 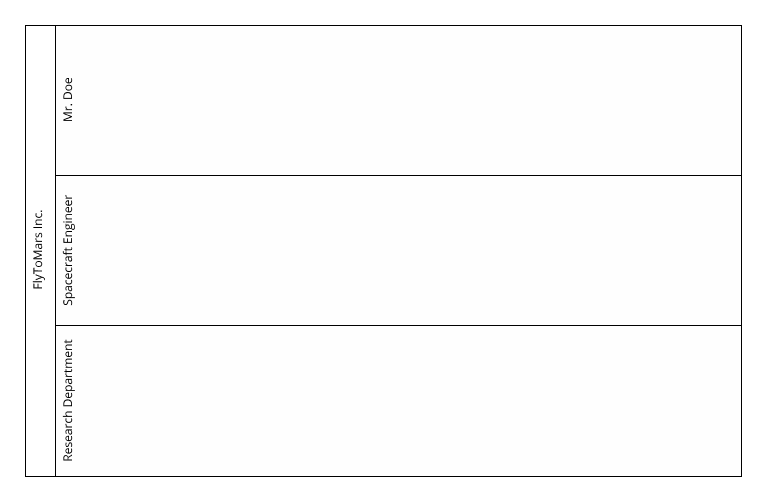 Start events — What triggers my processes? The start event initiates a process and triggers the first activity or gateway via a sequence flow connection. For example, an online shop’s order-to-delivery process is triggered by the start event order received. Strictly speaking, a process without a start event is never executed. End events — What is my business goal? In addition to a start event a process should always have an end event, which typically marks the business goal of your process. It occurs after the participants have completed one of the possible activity sequences. In the example below, the business goal is to send order. End events can also mark a possible failure to reach the business goal. In our example we fail to achieve the business goal if the products ordered are not available. Intermediate events — How does my business process interact with its environment? Intermediate events trigger changes that affect process execution and the interaction of the process with its environment. Let’s take a look at a job application process: The job applicant writes the application, then sends it via email. In BPMN, this is depicted by a throwing intermediate message event, which indicates that a message is sent. Now, the company has to wait for the application: The arrival is depicted by a catching intermediate message event, which implies that a message is received. Once this event has been triggered, process execution can proceed. Sequence flows — How do activities, events and gateways relate to each other? 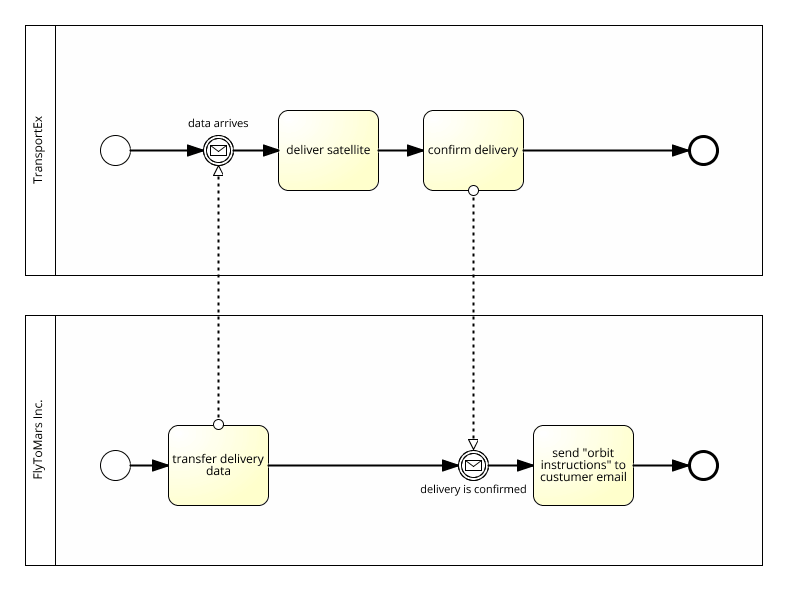 Sequence flows connect activities with each other, as well as with events and gateways to precisely express the order of execution. Note that sequence flows can only connect elements that are within the same pool: For communication that crosses pool boundaries, use message flows instead. Message flows — How does my business process communicate over organizational boundaries? The delivery address for the package is provided from the order website. Later, you confirm the arrival of the package by sending a message back to the website. Interaction is not limited to activities, but also occurs between pools! The message flows have these little circles on their tail — that’s where you plug them on the activities (or events) to signalize an outgoing message. Because the different lanes are part of your organizational context, you don’t have any kind of message flows occurring within them — use sequence flows instead. What associations are involved in my business process? Associations connect text annotations, data stores and data objects, as well as the BPMN extension elements additional participants and IT systems to your process flow. Associations can be directional (have an arrowhead) to indicate read or write access. When associations don’t express read/write access, we use non-directional associations — without the arrowheads. For a practical example see external participants. 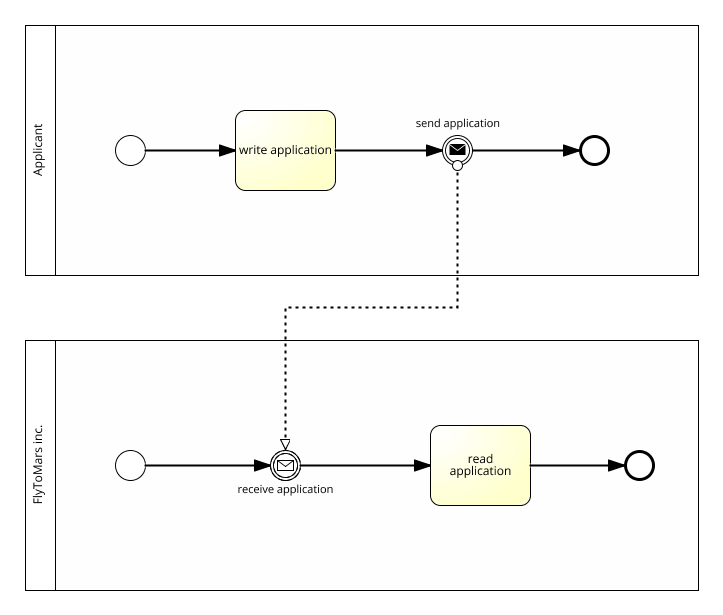 Gateways allow to control as well as merge and split the process flow. Parallel Gateways (AND) — How are parallel activities handled in my business process? In many cases, you want to split up the flow within your business process. For example the Finance and HR departments may examine a new employment contract at the same time. This reduces the total cycle time for a case. To express parallel flow in BPMN, you use a parallel gateway. A splitting parallel gateway multiplies the incoming sequence flow into several outgoing sequence flows that run simultaneously. A joining parallel gateway waits for all incoming sequences to terminate before combining them all in one outgoing flow. Event-based Gateway — Do different events trigger different activities? Event-based gateways and exclusive gateways are functionally similar. You follow only one path out of the (many) options you have. But there are two important differences. Event-based gateway are triggered exclusively on intermediate events, and they wait for them to occur, before they trigger a decision — without the process participants’ direct influence. Event-based gateways only consider the first event that occurs. Let’s take a look at the example below. After a crime happens, the detective starts solving the cases. Even if the letter arrives later, the detective will not decode the secret message, as he is no longer waiting for the event-based gateway to be triggered. Data objects — What data do I access, create or manipulate? A business process usually requires and produces data. Whenever a manager creates a business plan, for example, this document is available for other process participants to read or improve. Data objects make data in your business process explicit. They don’t provide a complete overview of the data that’s accessed and created, but rather inform the reader about the documents and data stores that are most relevant. As a general rule, you should use data objects to highlight documents (or other data objects) that process participants rely on to resolve a task. What IT-Systems are involved in my business process? The IT Systems element is a Signavio-specific extension of BPMN. Many Signavio customers use them to explicitly define IT systems that support manual work. And as you can see in this example model, IT Systems also make an exception. You use non-directional associations to connect them with activities instead of the directional associations you use for other artifacts. What roles are involved in executing a task, besides the ones carrying the main responsibility? So far there was always one process participant executing one activity — but what happens if there is not exclusively one actor involved? To model reality more concisely the Signavio Process Manager supports the additional participant BPMN extension. Connect an additional participant via an association to an activity. This expresses that the activity requires this actor’s participation for successful execution. Looking to put your newfound knowledge to use? 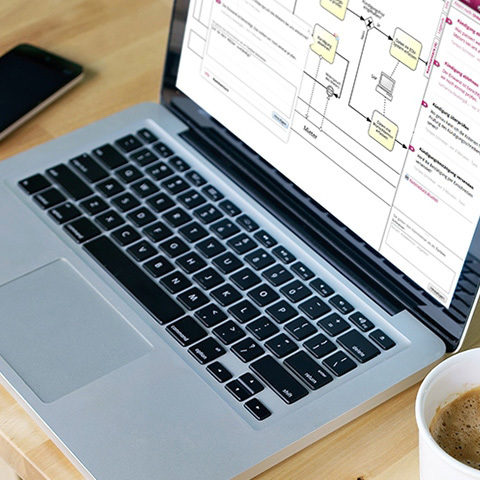 Why not check out our free trial, and start using BPMN 2.0 with our intuitive, collaborative solutions!